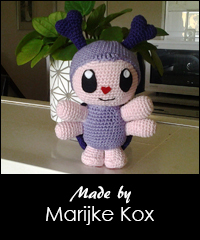 A new pattern for the bug collection! This ladybug is a bit bigger than the other plushies because I used thicker yarn and a bigger crochet needle. It will be about 27 cm tall. I absolutely LOVE this pattern and my daughter would really like to have this one in her room! I have called my granddaughter LadyBug since the first time I held her and what a surprise this would be for her as she turns 16 this year. This is just a darling lady bug! So Cute!! I love your patterns. I wish you had some for free because I don’t send money from my account overseas. It’s too big of a hassle with my bank. They always deny overseas purchases. Your little ladybug is as cute as a “bug”. I love all your patterns Sabrina, you are amazingly talented with a keen eye for detail. I hope I get a chance to ry out this new ladybug pattern soon!!! This is really cute. Great design. Congratulations! You’re one of the winners of the giveaway. I added the pattern to your account ? This is the cutest ladybug ever! My daughter would love her. You are very talented. Thank you for sharing!